Bob and Helen Parr are living in a cheap motel, trying to feed three kids, and searching for any sliver of hope. This isn’t what they expected when they became superheroes, but when the countries of the world banned their kind, Bob (Mr. Incredible) and Helen (Elastigirl) went into seclusion. Then Bob lost his position at an insurance company, and a few days later their house burned to the ground. The government’s Superhero Relocation Program will pay for the motel for two weeks, but after that, they’re on their own. “One of us has to get a job,” Helen says. But their superhero friend Lucius (Frozone) has other ideas. He knows a wealthy CEO named Winston Deavor who is pro-superhero and wants to change the public’s perception of superheroes – from that of people who destroy property to that of men and women who perform heroic actions. Winston and his sister, Evelyn, have a plan: Place body cameras on all superheroes and feed the footage to media outlets, who then will broadcast the images of the Incredibles and Frozone saving the day. The public will learn to love superheroes. The Incredibles even will be given a new home! There’s just one catch: The Deavors want to test the program on only one superhero: Elastigirl. (Supposedly, she’s not as destructive). This, of course, will force Mr. Incredible to be a stay-at-home dad and take care of Violet, Dash and Jack-Jack – three kids who have superhero powers and who on an average day are more than a handful. 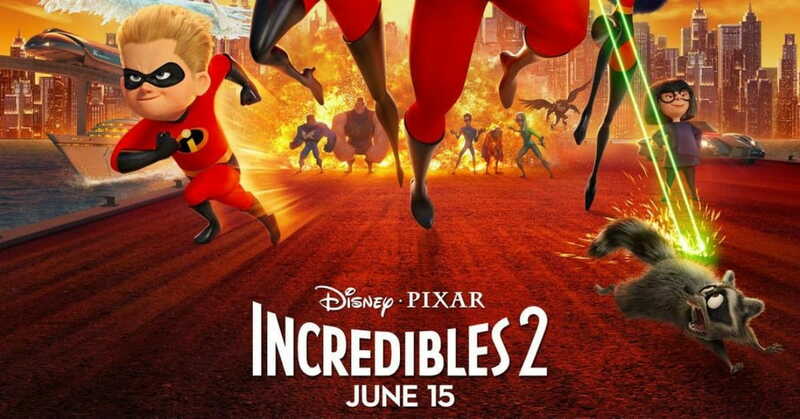 It’s all part of 'Incredibles 2' (PG), which opens this weekend as a sequel to the 2004 film 'Incredibles,' which finished No. 5 in total gross that year and remains No. 19 all-time on the chart of animated films.It stars Craig T. Nelson (Coach) as Mr. Incredible, Holly Hunter (Oh Brother, Where Art Thou?) as Elastigirl, Sarah Vowell (This American Life) as Violet, Huck Milner as the new voice of Dash, Eli Fucile as Jack-Jack, and Samuel L. Jackson as Frozone. And likely as funny as the first one. Jack-Jack steals the show for much of the movie, as we learn about his new superhero powers when he sneaks out of the house, wrestles a racoon, and later helps defeat a villain. I enjoyed him even more than Baby Groot (Guardians of the Galaxy 2). Thankfully, Incredibles 2 contains little if any of the potty humor prevalent in other animated movies. Kudos, Pixar! 2. It might disturb young children. Incredibles 2 has the same amount of bloodless violence that we saw in the first installment – with plenty of punching and kicking – but this one has a few disturbing scenes that weren’t present in the 2004 version. Specifically, a villain named Screenslaver uses mass hypnosis (through TV screens) to put people in a trance. It’s eerie. We also learn that the father of a main character was shot and killed during a home robbery. In a flashback, we see the robbers and the gun but not the actual shooting. 3. It has a few coarse words. I counted about five: OMG (2), h-ll (1), d-ned (1) and a misuse of “oh Lord” (1). I have to ask: Why did Pixar put them in there? Kid’s movies are supposedly a sanitized look at reality. We see violence without blood. Marriage without sexuality. Why include language? It’s disappointing. 4. It contains no sexuality/sensuality. Violet goes on a date, and Bob and Helen kiss, but that’s it. Of course, the costumes worn by our famous superheroes are skin-tight, but you already knew that, right? 5. It has a great message about parenting. That is: Parenting is as important as being a superhero. As Edna Mode tells Mr. Incredible, “Done properly, parenting is a heroic act.” But within that one message are other lessons: Children need a mom and a dad. Parenting requires teamwork. Absentee parenting has negative consequences. It takes a village to raise a child. Some moviegoers might even see subtle, positive messages about traditional roles within the family. After all, Mr. Incredible – as hard as he tries – simply cannot be a mom. 6. It can spark a conversation about unjust laws. Such as: When is it biblically permissible to break an immoral law? In the world of the Incredibles, it’s illegal for superheroes to help people. Mr. Incredible argues: The law is wrong! So, Elastigirl breaks the law to show that the law needs to be changed. It can make for a good discussion on the ride home. 7. It is preceded by a Pixar short film. Called Bao, it tells the story of an Asian mom who is baking dumplings when one of them comes to life. I’ve got to be honest: I was confused – at first. But once I understood the message behind the “living dumpling,” I loved it. Incredibles 2 is rated PG for action sequences and some brief mild language.